I used to be very maarte with my coffee. I have, not just a coffee maker, but also a coffee grinder at home before and I would make sure that the Arabica beans I buy will be of really good quality. I would often ask friends who go up to Baguio to buy me good coffee beans. "I may be late for work, but at least my coffee's freshly grounded!" Yep. That was me. But things changed when I moved to Pampanga. I needed to live with instant coffee because (1) I didn't have a coffee grinder (but I have a coffee maker still) there and (2) I'm way too busy to maintain that picky coffee drinker attitude. 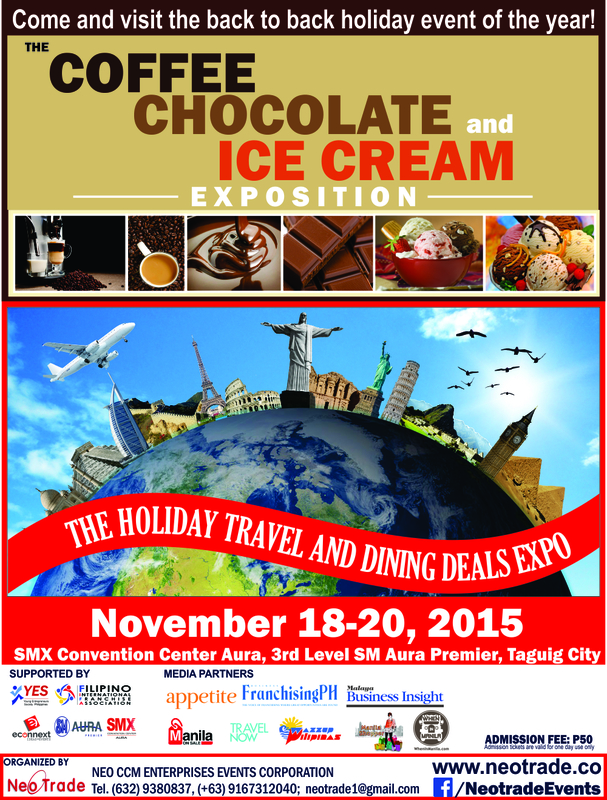 And then I found out about The Coffee, Chocolate, and Ice Cream Expo on November 18 to 20, 2015 at the SMX Convention Center Aura, 3rd Level SM Aura Premier, Taguig City. 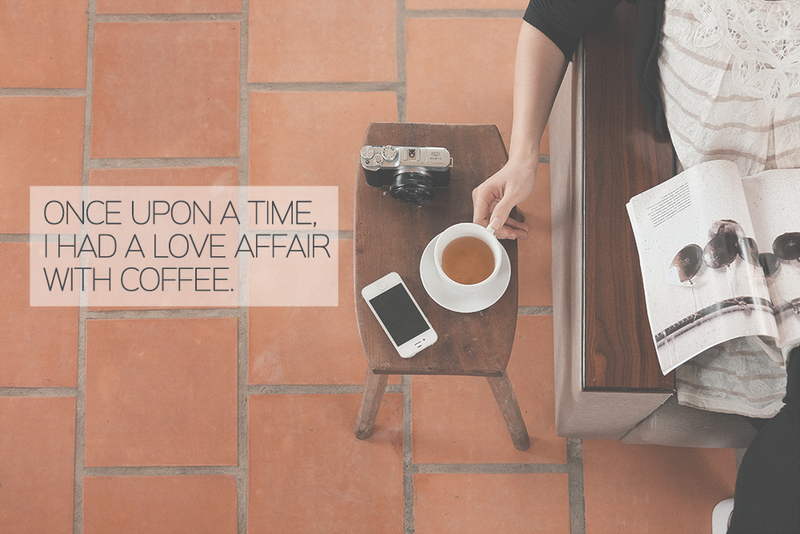 Coffee used to be my comfort drink and it helped me get through those sleepless nights when I needed to keep myself up to work; so why not let it into my life again? And even though I'm not a big chocolate and ice cream lover (I actually don't like the taste of chocolates or anything sweet), my sisters would surely want to go to this expo! They both drool over chocolates and ice creams! Another good news (not just for you but also for me)! This event is co-located with the Holiday Travel and Dining Deals Expo. Since my partner and I have been planning on going to Cambodia for summer (we'd be booking before the year ends) and then Cebu for our birthday, I so need to be here! The Coffee, Chocolate, and Ice Cream Expo will be featuring showcase the finest local and international coffee, chocolate and ice cream products, bar and café equipment and technologies all under one roof; There would be coffee, chocolate and ice cream manufacturers, coffee and ice cream machines, vending machines, roasters, blenders, processors, flavored drinks manufacturers, milk retailers, retail coffee chains, milk and milk products, chocolate manufacturers, coffee and tea accessories, friends of coffee and tea, ice cream machines, distributors, dealers, manufacturers, and partners. So if you're someone who just doesn't love coffee but also planning on starting a business in the industry, this is the place to be! 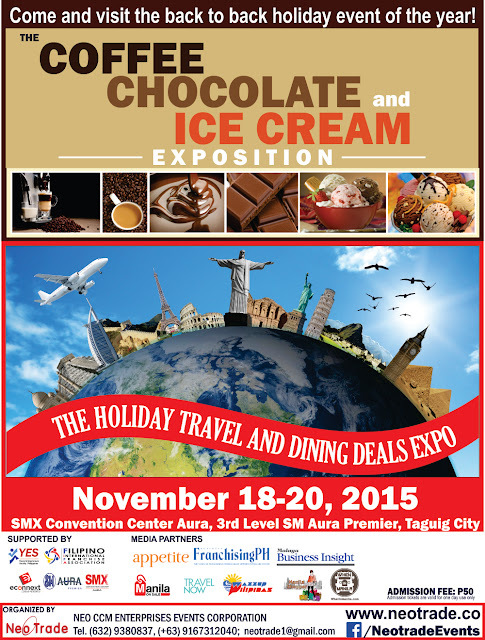 The Coffee, Chocolate and Ice Cream Expo back to back with the Holiday Travel and Dining Deals is supported by Filipino International Franchise Association, Young Entrepreneurs Society, Malaya Business Insight, One Mega Group: Travel Now, Apetite, Franchising Magazine, WazzupPilipinas, WhenInManila.com, ManilaonSale.com, ManilaShopper.com and EConnext Media Corp.
For inquiries, you can get in touch with their event organizer, NEO-CCM Enterprises Events Corp. at (632) 938 0839 or log on at www.neotrade.co. Please like us at www.facebook.com/NeotradeEvents.